In July 2016, Bernstein Research, a firm that analyzes material costs, put the price tag at $15 billion to $25 billion, for a wall that stretches 1,000 miles and is 40 feet high, which was Trump’s initial desired height. In January 2017, Senate majority leader Mitch McConnell said the wall would be $12 billion to $15 billion. In February 2017, a leaked report from the Department of Homeland Security put it much higher, at $21.6 billion. In April 2017, the Democratic staff of the Senate Homeland Security and Governmental Affairs Committee said in a report that costs could soar to nearly $70 billion — not including the significant costs and legal resources required for land acquisition. 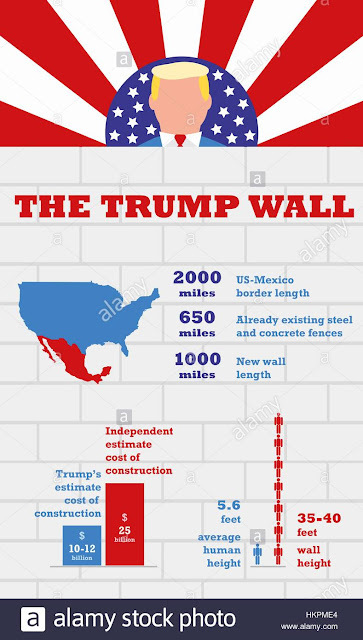 Every smart person knows that Donald Trump was not going to get his border wall built. Donald was just trolling his racist, xenophobic supporters. The problem is not Trump's proposal to build a wall, but the people who support his doing so. Who are these people and what makes them want a wall? I've never met a person who has really taken him seriously about building his wall. It's just razzle-dazzle nonsense that Trump likes to entertain folks with.